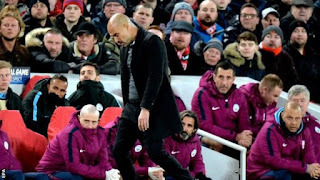 Pep Guardiola hinted at what was to come at a thunderous Anfield when he admitted Manchester City were the "perfect" opponents for Liverpool in the Champions League quarter-finals. It was not an attempt at reverse psychology by Guardiola but an acknowledgement that if one team's style is built to destroy City's smooth rhythms and potency it is Liverpool's high-octane approach under Jurgen Klopp. And so it proved as all Guardiola's fears were realised and lightning struck twice for the Premier League champions elect in the first leg. The only defeat on their relentless march to the title, a 4-3 loss at Anfield in January, was followed by an even more emphatic beating on an atmospheric night of pure theatre that leaves Liverpool with a commanding three-goal advantage to take to Etihad Stadium next Tuesday. Liverpool and their fans celebrated wildly and understandably so at the final whistle - but the darker side on this night must not be ignored. City's team coach was badly damaged as it was 'welcomed' by Liverpool fans. It was unusable for the post-match return journey after coming under attack from bottles, cans and pyrotechnics before the game. Liverpool swiftly apologised "unreservedly" and Merseyside Police - who condemned the attack as "appalling" - began an investigation. But what was arguably most disturbing of all was this so-called greeting had been flagged up on social media in advance of the game and drawn concern from City, yet was still seemingly impossible to stop.